1. 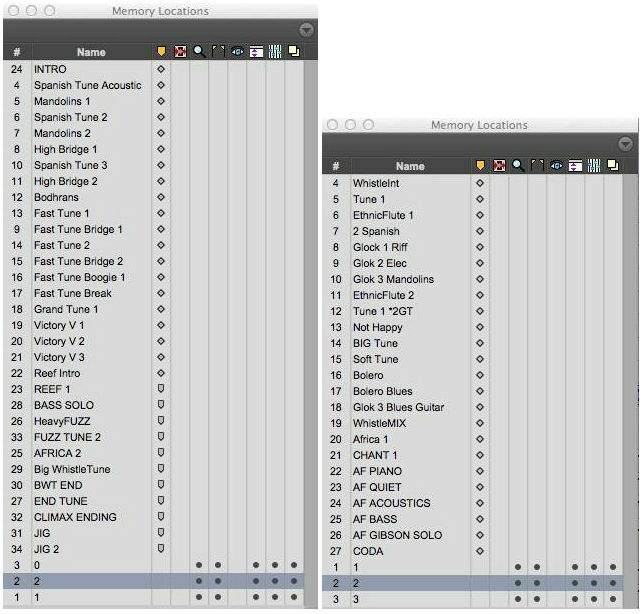 I think "Fast Tune 2" and "Fast Tune Bridge 2" have been removed from the final edit, it doesn't seem like the music follows the pattern of tune-bridge-tune-bridge-boogie there. 2. There are some seemingly counter-intuitive titles like the "Big WhistleTune" that doesn't have any clearly audible whistles. I guess this is because the whistles have been removed later from the mix in this section. 3. 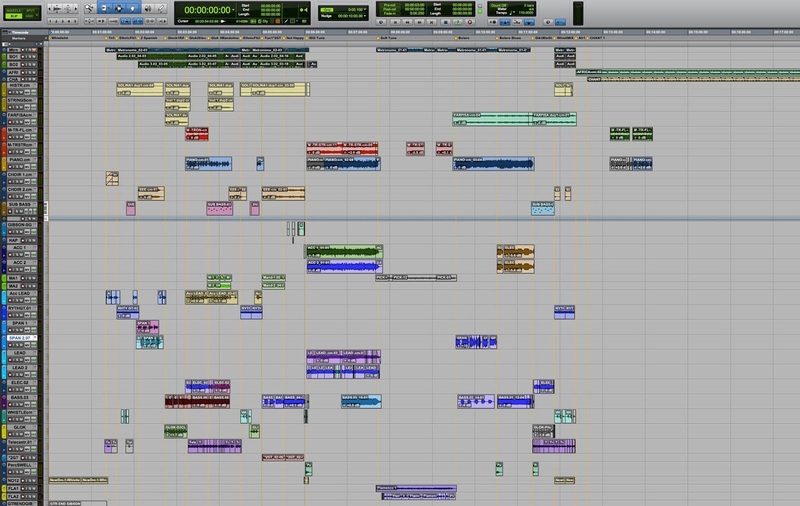 For Part 1, this later screenshot from Pro Tools is also helpful. It also reveals that the section roughly between 4:31 and 4:46 was added late in the process (after the screenshot was taken). Indeed, I have a personal theory according to what Oldfield's music follows a pattern that looks like Filling > Crescendo > Filling > Crescendo > Filling > Sad Tune > Filling > Crescendo > Filling > Big Crescendo > Bonus or some similar combination of crescendos and sad tunes separated by fillings, ending with a big crescendo and some optional bonus. In my opinion "Victory" is the most glorious melody Mike has ever written! As I think I posted elsewhere on the forum, I interpreted the music following shortly after the "Victory" melody as describing a battle. I've just noticed that the main rhythm in this is da-da-da-dah, "V" in Morse code. Typical Mike brilliance. More Morse code. Around the 6 minute mark on side A there's the "HA-HA-HA HA-HA-HA" bit that I've mentioned before. In Morse code this is O O. Put the O's together and you get ∞. Part Two is a bit off a write off for me. There's literally 2 minutes from about 15:20 that sound like the real Mike. A jig performed on horseback may be the real Mike but it certainly paints an unusual picture! I stop before that starts. It is a pretty impressive 2 minutes I'm talking about tho. Uninhibited. Non formulaic. Do you want to tell Mike or shall I? I'll tell him when I see him. Remember he knows judo, so stand well back if you do! I have listened to this album a lot since it was released, and I still love it, and fail to understand the issue some people have with it. I love the whole album, but if I had to choose, Part 2 would be my favourite. I agree, and I never get tired of the "Victory" section in particular. It makes me very glad that he still makes beautiful music. This album is one of his most emotionally charged ones, isn't it? It certainly is emotionally charged, but there's also the sense that every melodic move is there for a reason. I'm inclined to make a comparison with Beethoven's symphonies, which similarly are emotionally charged and logically structured - but to my ears Beethoven often gets bogged down in sonata form. There's that beautiful melody in the first movement of the 7th symphony, for example, which - because of sonata form - we get to hear just once before Beethoven fiddles around with it and spoils it. I think it was in the liner notes of Boxed that Mike alludes to this sort of thing, where he says something along the lines of "there's nothing wrong with repetition, as long as what gets repeated is worth repeating". Yes indeed, that quote was about the more spartan version of Hergest Ridge on Boxed which is the version I adore.